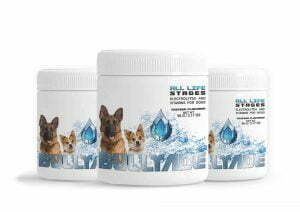 Subcutaneous or sub q fluids are solutions that help replenish electrolytes in your dog’s body. Normally, your pooch needs to be hospitalized while receiving sub q fluid therapy for dogs. However, you can learn how to administer sub q fluids to your dog at the comfort of your home. Why do Dogs need Sub q fluids? Subcutaneous or IV fluids are often administered to old dogs that are battling kidney problems. On the other hand, fluid therapy is also important for young dogs, especially puppies, to help them recover faster from diseases that cause diarrhea and vomiting. Your pooch is bound to lose a lot of nutrients and electrolytes when sick so the IV bag helps to replenish this loss. Why learn how to inject Sub q fluids? To begin with, your pooch has better chances of quick recovery when he is in a comfortable environment. Your home is the best place to give him his sub q fluids as he is surrounded by people that love him. Moreover, learning fluid therapy for dogs can help save the cost of making appointments to a vet clinic. Fluid therapy for dogs is a simple technique to learn. Your vet will provide the IV fluid kit necessary depending on what ails your dog. The kit comprises of the IV bag with the fluid and an insertion needle that goes under your pooch’s skin. Find a position you will both be comfortable. It can be a couch, countertop, or on top of a couch. Just ensure that both of you will be totally comfortable for the next 15 minutes or so. Now find an area on your dog’s body with soft folds of skin. The best parts are the top corners of his fore and hind limbs. Hold the roll of skin gently as you begin to insert the IV needle forward while pulling the skin backward. You will need to reassure your pup as he is likely to wince from the pain of the needle. Ensure that the needle goes in in a firm and steady motion. When you are satisfied with the insertion, release the skin gently and ensure that the needle remains inside. Now release the fluid set lock so the sub q fluids can flow into your dog’s body. It is okay to supplement your dog’s electrolytes while administering fluid therapy for dogs. 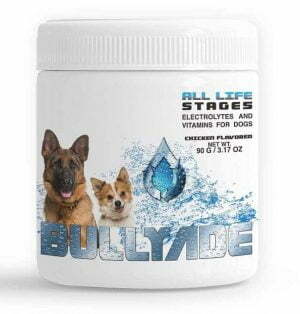 There are pet supplements like Bullyade that carry plenty of multivitamins and electrolytes that will help with your dog’s quick recovery. 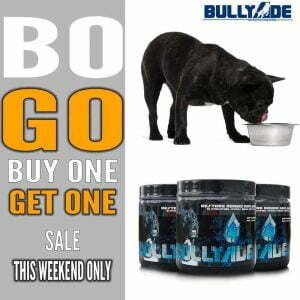 After a fluid therapy session, your pooch can gain more electrolytes by adding Bullyade supplement in his drinking water. Fluid therapy for dogs is best done at home where your dog will be comfortable enough to recover faster. It is okay to alternate IV fluids with pet supplements that help replenish electrolytes and nutrients lost by your dog during sickness.